Are you a daily commuter? No problem! If you're in your car Monday to Friday, commuting to and from work every day, you not only need something to protect your seats from coffee spills or food stains, but you want something that is comfortable too. Nothing is worse than sitting in your car during rush hour with cracked leather or rough cloth. 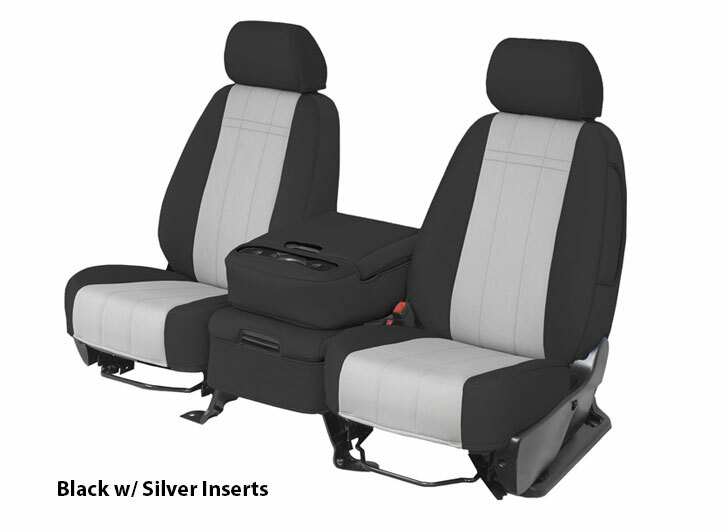 Our version of Neoprene car seat covers, Neo-Supreme, is a great way to add comfort and protection all-in-one. Plus, because it is an automotive material, you won't have to worry about it drying and cracking, which sometimes occurs with Neoprene custom seat covers. Like other Neoprene car seat covers, our covers come with a guarantee. This means that they are not only guaranteed to fit, but the quality and workmanship are guaranteed too. We want to offer the best neoprene seat covers and that's why we use our own Neo-Supreme fabric that goes through quality control, ensuring you get a good product that will last. Also very similar to Neoprene car seat covers, we have quite the selection in colors. We offer 9 colors that will suit all different tastes and personalities! If you are trying to go for a more subtle, classic look, our most popular color combination is Neo-Supreme Black with Charcoal inserts. 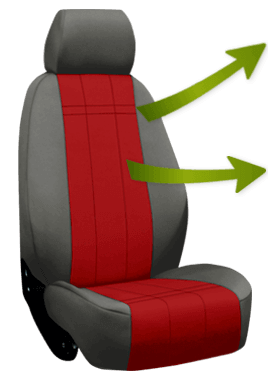 While our automotive version of Neoprene custom seat covers are extremely versatile, there are other materials that might be more suitable depending on the daily usage of your car or truck. Before making a final decision on material, you may want to take a look at other product options in order to make sure you're making the right choice. If you are looking for Neoprene seat covers for your Jeep Wrangler or another vehicle that experiences a lot of wear and tear, or if you have large dogs that travel with you on a daily basis, you may want to consider a more rugged, abrasion resistant and 100% waterproof material like our CORDURA® or Realtree Seat Covers. We just want to make sure that your car seat covers are going to last in your truck. We know that if you use your truck for construction or your large furry friend travels with you, neoprene truck seat covers might not be the most suitable choice for you. Doing a bit of research before ordering will go a long way - and keep your seats protected for miles and miles! Product Review: Good fit, nice color to fabric. Product Review: These were better than I expected very tailored and handmade fitting my seats perfectly.